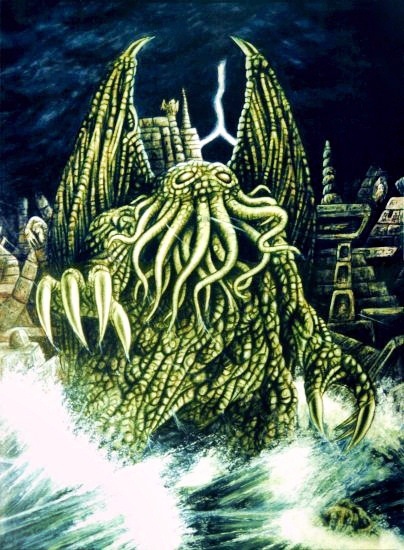 How would lord Cthulhu look like with noodles in his face instead of tentacles? About the same? Perhaps a slightly different color? Qwertyuiopasd wrote: About the same? Perhaps a slightly different color? He needs something to finger paints with. My notty mind aside ( ), I suppose it's more claw-painting than finger-painting. Or is it noodle-painting? Those wings were used by the Old Ones to fly through space, but they lost the knowledge of how to fly after aeons on the earth, so they're more vestigial if you look at the Old Ones who were born here. Wolfenstein wrote: How would lord Cthulhu look like with noodles in his face instead of tentacles?